People have written me asking for more information about the little osage orange plane in the side bar, so here are some images and measurements in case you would like to make one yourself. The plane is one piece of wood, so the most difficult part is chiseling out the wood inside the opening and being careful to ensure that the bed is perfectly flat. Layout your angles on the outside of your workpiece and transfer the angles across the top, down the other side, and on the plane's sole. Then, just keep an eye on your progress to make sure you maintain those angles as you chisel out the opening. Other woods that make good planes are applewood, maple, bloodwood, cocobolo, and many other dense hardwoods. Growth ring orientation, according to David Finck, author of Making & Mastering Wood Planes, is unimportant. I really love the plane! 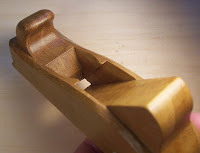 I'm always googling for info and pictures of wooden planes that’s how I discovered your blog. By the way it’s my favorite of all woodworking blogs. I like the variety of subjects and the quality and quantity of images. I’m a visual learner as I think most woodworkers are. Now that I’ve sucked up and admitted I’m your biggest fan please feel free to send me that plane. That's a dainty little plane. From the photo, I thought it was larger. Do you use it as a smoother? Yeah, it's a teeny little guy. It takes very fine shavings and would be great for touch up work. I haven't actually used it for anything yet; it just sits on a shelf and works on its suntan. Thanks for the write up. I have been wondering about that plane too. I guess I would be happy to volunteer to take it around the block a few times also! Well, you have done it again. I was ok with just the single pic - I could admire and move on - untill you made this post. But I've got a small batch of Osage I picked up for turning out in the garage, a grinder, a bunch of old mushroomed plane blades, hoping for a second life... and now, the Finck/Krenov book on order from an old book seller linked to Amazon. So put me on the list with Axeman: your slowly setting up a 'want to do' list that will keep me in happy pursuit longer the I'm likely to keep alive... what joy, thanks! I make wooden bows (selfbows), mostly of osage, and your plane peaked my interest. Osage is a great wood; incredibly dense, resistant to rot, and not affected very much by changes on temperature and moisture. I suspect that an osage plane will stay true for a very long time. Great blog, btw. Hi, this is a beautiful piece of work. Did you need to use special floats for this or can it be done just with chisels? 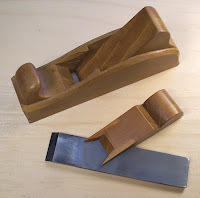 Do you think this is a better approach to making planes compared to laminating if you're limited to hand tools? I'd like to try it but information on the method seems limited compared to making the Krenov type. David, I just used chisels for this plane. Laminated planes and solid body planes work equally as well; it's just a matter of which style you prefer. David Finck's book on making the Krenov planes is excellent. I learned to make them in a class that he taught and he is an outstanding instructor. I'm currently blogging about making a solid body smoother if you'd like to see how to make one (although I'm making some mistakes). There is little information on the internet about making one, and I believe the two books I'm using are out of print. You could try a library search for them as one reader suggested. Feel free to shoot me an email and I'll try to help.